Ready for this excitement chalenge? if you trully an adventurer, try The Mount Kilimanjaro. How to climb mount Klimanjaro, Tanzania? o.k here we go. 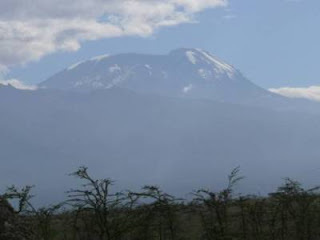 At 19,336 feet, snow-capped Mount Kilimanjaro in Tanzania is Africa's highest peak. It is the world's tallest walkable mountain, and what a walk it is. You go through 5 different climatic zones to reach the summit. Follow the advice and tips below and you should reach the "roof of Africa" in good health. 1. Find a good tour operator. You can only climb Kilimanjaro with an organized trek and along established routes, so you have to go with an operator. The operators vary from excellent to downright negligent so be selective and do not to be too cheap (see tip below for costs). Break in your hiking boots and walk the dog; climb stairs; hike some hills with a pack on -- walking is the best way to prepare yourself for the long hike up Kilimanjaro. You need to build up stamina. It's a good idea to get a basic medical check-up before you go. You don't want to be dealing with an ingrown toenail or worse at 18,000 feet. Travel insurance that includes medical is also a must. Pack light but make sure you have everything you need to deal with altitude and variation in temperatures. Don't worry about carrying it yourself since a porter will take up to 30lbs (15kg) of your personal gear in a duffel bag. You can rent some equipment and clothing locally but you may end up with teeny sleeping bags and a fraying pink jacket. Make sure your hike is at least 6-7 days for maximum success. Any shorter and you will not be properly acclimatized. Routes vary in degree of difficulty, traffic and scenic beauty. The least difficult routes are Marangu and Rongai; the more difficult routes are Machame, Shira and Limosho. The longer routes may have more difficult hiking but you'll be more acclimatized and your chances of reaching the summit are therefore higher. The longer western routes also allow you to start your summit day at a more reasonable hour. For details on each route see ATS Route Descriptions. Pace yourself; you will hear the Swahili phrase "pole pole" - slowly slowly, heed it well. Drink lots of water about 4-5 liters a day is recommended. Luckily the mountain streams after the first day are good to drink and naturally cooled. Walk high and sleep low. Take a walk to a higher elevation during the day and come back down to sleep. Consult a doctor before you go and get some medication to prevent altitude sickness. Also make sure your guides are carrying the proper medical equipment such as oxygen, radios and a recompression bag to deal with altitude sickness if it arises. The hardest part of the trek. Pace yourself, be determined, and you will reach the Uhuru peak. The final ascent is usually timed so you can watch the sunrise over the crater and distant plains. Enjoy the view take a few photos and get back down before you get too affected by the high altitude. Take a well earned nap. 8. Book yourself in to the Arusha Coffee Lodge and have a celebratory drink. Cost: A trek can cost from $2400-$5000 per person. The fee includes camping, food, guides, park fees and transport to and from the mountain. You want to make sure your food is decent, your guides and porters are well paid and well trained and you get a good night's sleep. While the shorter routes are cheaper, you actually have less chance of reaching the summit because you don't have the time to acclimatize to the altitude. If you opt for a "good deal" make absolutely sure that your guides and porters are well-equipped to handle emergencies. Leave your passport, credit cards and traveller checks at a hotel, you won't need them on the mountain. Do take copies of your important papers with you in case of an emergency. Also take enough money with you to tip your porters, guides and cooks. Ask your tour operator what the typical tip amounts should be beforehand. Digital camera equipment doesn't always perform well under very low temperatures. The batteries can't deal with the cold weather so make sure you wrap them in your sleeping bag or put them in your jacket pocket. Also, check the specs before you go and take extra batteries with you. You probably won't want to climb up to the summit again to get that snapshot. Familiarize yourself with the symptoms of Acute Mountain Sickness(AMS), usually headaches, nausea and disorientation. If you feel any of these symptoms descend!